This year celebrate in France, Sweden, Germany, England, Italy, Greece, Mexico, Australia, the United States, Canada, and Poland with our many activities. (Open thematic poster-Christmas around the world) Print, laminate, and decorate the walls of your daycare with all kinds of posters. This tool was created in response to a special request received. (Open Giant coloring Advent calendar) Print and assemble the various parts. Display the calendar on the wall. Children can take turns coloring the daily pictures. The educatall team suggests you take a brief look at the different customs which surround Christmas around the world. We have prepared an itinerary which can be followed with the children in your group. (Open world map-Christmas around the world) You may visit the countries in the order of your choice. We suggest beginning in Canada to allow children to discuss their own family traditions. Poni, your guide, will lead you to other countries and help you present each country's customs to your group with the help of postcards. Have a wonderful trip! 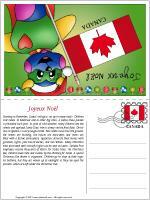 (Open card-Christmas in Canada) Print and laminate. Hang a garland in your daycare. Once you have visited a country, you can hang the corresponding card on it. Children can use the garland as a reminder of what they have seen throughout their trip. Starting in November, Santa's village is set up in many malls. Children visit Santa. In Montreal and in other big cities, a Santa Claus parade is presented each year. In spite of cold weather, many children line the streets and applaud Santa Claus who is always on the final float. Christmas in Quebec is a very magical time. Pure white snow lines the ground, the streets are bustling, the houses are decorated, and stores are filled with a festive atmosphere. Quebecers decorate their homes with garlands, lights, pine tree branches, and red ribbons. Many Christmas trees decorated with colourful lights can be seen on lawns. Canada Post employees receive thousands of letters for Santa Claus. On Christmas Eve, children leave milk and cookies by the chimney for Santa. A special Christmas Eve dinner is organized. Children go to sleep at their regular bedtime, but they are woken up at midnight so they can open the presents which are left under the Christmas tree. (Open stationery-Christmas) Print for each child. 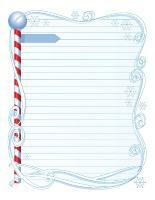 Children may use the stationery to write their letter to Santa. Provide several different catalogues and have children cut out the toys they would like to receive. They can glue them on the stationery. If you wish, children may draw the toys instead. Help children write Santa Claus' address on an envelope and remember to include your return address. As a group, drop the letters in the nearest mailbox. Bake cookies with your group. Once they are ready, have children place them in a special plate. They can give them to Santa when he visits the daycare during your Christmas party. Variation: Pretend to make cookies with modeling dough and cookie cutters. Organize a trip to your local mall to meet Santa Claus. Ask a few parents to accompany you. Variation: You may also ask a grandfather (or a father) to dress up like Santa Claus. Ask him to visit your group. Offer a wide range of arts & crafts material. Let children create different Christmas decorations which can be used to create a festive atmosphere within the daycare. Visit our "Christmas-Decorations" theme in the archives section. It provides a multitude of craft and decoration ideas. 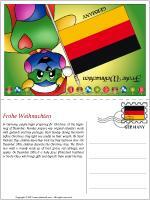 (Open card-Christmas in Germany) Print and laminate. Once you have visited the country, hang the card on a garland. Children can use the garland as a reminder of what they have seen throughout their trip. In Germany, people begin preparing for Christmas at the beginning of December. Families prepare very original calendars made with garlands and tiny packages. Each Sunday during the month before Christmas, they light one candle on their wreath. On Saint Nicholas Day, children leave their boots by their bedroom door. On December 24th, children decorate the Christmas tree. The Christmas meal is mainly made up of roast goose, red cabbage, and apples. On December 24th, it is baby Jesus (Protestant tradition) or Santa Claus who brings gifts and deposits them under the tree. Hang a long Christmas (or pine) garland in your daycare. With your group, prepare tiny gift boxes in different shapes and sizes. Write the numbers 1 to 25 on the boxes. Hang the boxes on the garland in the correct order to create an original calendar. Variation: If you wish, insert tiny surprises inside each box and let children take turns opening the boxes each day. Trace an enormous wreath shape on white cardboard and have children glue pine needles on it. Germans use candles to light up their wreaths. (Open models-candles) Print a copy for each child. Have children crumple tiny pieces of tissue paper they can then stick on their candle model. Once their model is full, glue the candles on the wreath. Display on a wall. 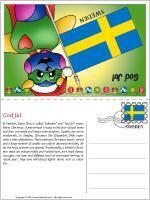 (Open card-Christmas in Sweden) Print and laminate. Once you have visited the country, hang the card on a garland. Children can use the garland as a reminder of what they have seen throughout their trip. In Swedish, Santa Claus is called "Jultomte" and "God Jul" means Merry Christmas. A pine wreath is hung on the door of each home and stars are made and hung in the windows. Candles are set on windowsills. In Sweden, Christmas Eve (December 24th) represents a time of festivities. The traditional Christmas meal is served and a large number of candles are used to decorate the table. After the meal, presents are opened. Traditionally, a Swedish Christmas meal can include boiled and roasted ham, pork head cheese, sausages, rice stew and different kinds of marinated herring. In recent years, they have introduced lighter dishes such as salads too. Trace a candle shape on contact paper. Have children decorate the candle using a variety of materials (metallic confetti, tissue paper, feathers, etc.). Add another piece of contact paper on top and cut out the candle shape. Display on a windowsill. (Open model-star) Print. Ask children to apply white glue to the entire surface of their star. Next, have them sprinkle sugar and/or salt on the glue. Let dry and hang from the ceiling. You will have shiny star decorations! You will need six Popsicle sticks per child. Have children glue the Popsicle sticks together to create two triangles (3 Popsicle sticks per triangle). Stack the triangles to create a star shape. Let children paint their star and add glitter or other elements of their choice. 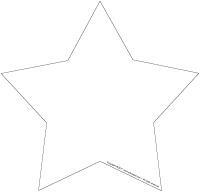 Hang the stars within the daycare or over their cubbyholes. Variation: If you prefer, you may stack cardboard triangles instead of using Popsicle sticks. 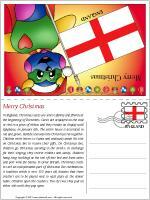 (Open card-Christmas in England) Print and laminate. Once you have visited the country, hang the card on a garland. Children can use the garland as a reminder of what they have seen throughout their trip. In England, Christmas cards are sent to family and friends at the beginning of December. Cards are displayed on the wall or tied to a piece of ribbon and they remain on display until Epiphany, on January 6th. The entire house is decorated in red and green. Families decorate the Christmas tree together. Children write letters to Santa and anxiously await his visit on Christmas Eve to receive their gifts. On Christmas Eve, children go Christmas caroling in the streets. In exchange for their singing, they receive trinkets and candy. Children hang long stockings at the end of their bed and leave cakes and port wine for Santa. In Great Britain, Christmas crackers are an indispensable part of Christmas Eve celebrations. A tradition which is over 150 years old dictates that these crackers are to be placed next to each plate at the dinner table. Children open the crackers. Two by two, they pull on either side until they pop open. 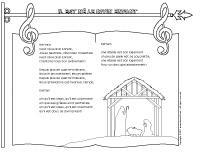 (Open Christmas song book) Print. Practice several different Christmas songs with your group. On the last day before Christmas, visit other groups and sing songs for them. If you wish, you may give the other early childhood educators candy pieces they can offer your group to thank them for their singing, just like Christmas carollers in England! If there are parents who work nearby (or a retirement home), you could visit them and share your songs with them too! Crackers are a very important tradition in England. You can make your own with the children in your group. Give each child an empty toilet paper roll along with confetti, wrapping paper (or white paper which can decorated), and two pieces of ribbon. Close off one end of the cardboard tube by twisting the wrapping paper and securing it with ribbon. Pour confetti inside and simply close off the other end of the cardboard tube the same way. Ask parents to provide old Christmas cards or to make a few original cards with their children. Purchase a piece of wide ribbon for each child. Glue the cards on the ribbon from top to bottom and hang them on the wall. Write each child's name on his Christmas card garland. Variation: If you prefer, children can make a card for each member of their family with your help. They can take their card garland home and hang it next to their family's Christmas tree. 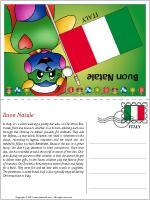 (Open card-Christmas in Italy) Print and laminate. Once you have visited the country, hang the card on a garland. Children can use the garland as a reminder of what they have seen throughout their trip. In Italy, it's a witch wearing a pointy hat who, on Christmas Eve, travels from one house to another on a broom, entering each one through the chimney to deliver presents for children. They call her Befana... a nice witch. However, her head is sometimes in the clouds. According to legend, shepherds told her which star she needed to follow to reach Bethlehem. Because she was in a great hurry, she didn't pay attention to their instructions. Since that day, she has travelled around the world in search of the star. Children display her picture in their window so that she doesn't forget to deliver their gifts. In the South, children play the flute in front of churches. On Christmas Eve, everyone invites friends and family for a feast. They serve fish and eel stew with ravioli or spaghetti. The panettone, a sweet bread loaf, is also typically enjoyed during Christmastime in Italy. Hide several stars within your daycare (or outdoors). Children must search for the stars, just like the Befana searches for a star throughout the world. Invite them to drop them into a special basket or box to ensure they are not lost again. Italian children play the flute during Christmastime. Children can make flutes of their own. Give each child an empty paper towel roll in which you have made holes where children should place their fingers using a hole-punch. Staple one end closed. Add a piece of cardboard to represent the mouthpiece. At the other end, cut little strips like the ones found on party horns. Let children paint and decorate their flute. Organize a parade. Children can make flute-like sounds with their mouth. If you have a hidden talent and know how to play the flute, demonstrate for your group. This will allow them to get to know this instrument. 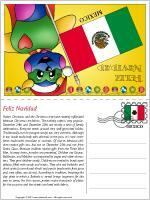 (Open card-Christmas in Mexico) Print and laminate. Once you have visited the country, hang the card on a garland. Children can use the garland as a reminder of what they have seen throughout their trip. Father Christmas and the Christmas tree have recently infiltrated Mexican Christmas traditions. The nativity scene is very popular. December 24th and December 25th are mostly a time of family celebrations. Everyone meets around very well-garnished tables. Traditionally, turrón (nougat candy) was very common. Although it was made exclusively with almonds in the past, it is now sometimes made with chocolate or coconut. Of course, Mexican children receive gifts too, but not on December 25th and not from Santa Claus. Mexican children receive gifts from the Three Wise Men. In every town, parades are presented. Children see Gaspar, Balthazar, and Melchior accompanied by pages and other characters. They give children candy. Children are invited to break open piñatas filled with candy and treats. They also eat buñuelos and drink atole (a corn-based drink) and punch (made with fruit juice and, very often, eau de vie). According to tradition, breaking the clay plate in which a Buñuelo is served brings happiness for the year to come. For this reason, potters make thousands of plates for the occasion and the streets are lined with debris. 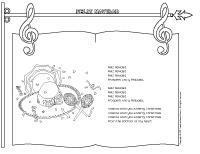 (Open songs & rhymes-Feliz Navidad) Print. Learn this traditional song with your group. Children will be happy to recognize it and sing along when they hear it on the radio. Create your own piñata with your group. Mexican piñatas are often shaped like a star with seven points, but you can choose any shape you want. Simply use fairly thin cardboard and use it to create your shape. Cover it with layers of papier-mâché (strips of newspaper dipped in glue). Let dry and decorate. Don't forget to leave a small opening so you can insert goodies! Hang from the ceiling and let children take turns hitting it with a stick until it cracks open. They will love collecting the goodies! (Open Three Wise Men) Print. Introduce your group to the Three Wise Men. Have children choose which one they want to reproduce. Have them cut the different pieces out and glue them on an empty toilet paper roll. Make your own salt dough and use it to make plates with your group. Once dry, children can paint their plates with bright colors like the ones seen in Mexico. Prepare the following recipe with your group. Reduce heat and simmer for three minutes, without stirring. Let cool. At the last minute, add Ginger ale. Garnish with fruit pieces and cherries. 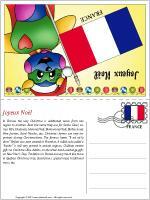 (Open card-Christmas in France) Print and laminate. Once you have visited the country, hang the card on a garland. Children can use the garland as a reminder of what they have seen throughout their trip. In France, the way Christmas is celebrated varies from one region to another. Even the name they use for Santa Claus varies: Père Chalande, Homme Noël, Bonhomme Noël, Barbassioné, Père Janvier, Saint Nicolas, etc. Christmas hymns are very important during Christmastime. The famous hymn Il est né le divin Enfant was even created in Provence. A rolled cake called a "buche" is still very present in certain regions. Children receive gifts on Christmas Eve. Adults, on the other hand, exchange gifts on New Year's Day. Traditions in France are very much like those in Quebec: Christmas tree, decorations, special meal, traditional mass, etc. Collect small logs. Have children paint and decorate them. Listen to the song Il est né le divin Enfant with your group. Children can try to sing along or learn certain words. (Open songs & rhymes-Il est né le divin Enfant) Print. Prepare several different colors of homemade modeling dough. Give each child a paper plate. Have them use the modeling dough to create the foods they would like to eat as part of their Christmas feast. Let dry and glue the items on the plate. Collect several empty glass jars (for baby food). Cut colourful tissue paper into tiny pieces. Children glue them on the jars with white glue (or Mod Podge), creating several layers. They must completely cover the jars. Add a tiny tea light candle. 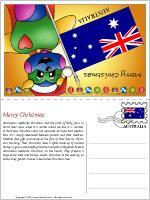 (Open card-Christmas in Australia) Print and laminate. Once you have visited the country, hang the card on a garland. Children can use the garland as a reminder of what they have seen throughout their trip. Australians celebrate Christmas and the birth of Baby Jesus in torrid heat since, when it is winter where we live, it is summer in Australia. Christmas does not represent an important celebration. It is simply celebrated between parents and their children. Children find gifts and candy at the foot of their bed on Christmas morning. Their Christmas meal is often made up of roasted turkey or goose and pudding like the one eaten in England. Several Australians celebrate Christmas on the beach. They prepare a huge picnic with cold turkey, salads, and cake. In the evening, at home, they gather around a decorated Christmas tree. Children will need their bathing suit, beach towel and sunglasses. Set up a kiddie pool filled with sand and umbrellas. Greet children with fruit punch. Of course, don't forget Christmas decorations. Take pictures of the children in your group. Have them wear their bathing suit and sunglasses and deposit gifts and Christmas garlands around them. Variation: Invite parents to join you at the end of the day for a special Australian Christmas party! Decorated Christmas trees are very important for Australians. You will need a large piece of white cardboard. Children press their hands in green paint (you may use different shades of green), spread their fingers and make prints on the cardboard. You can complete the top of the tree yourself. Once dry, decorate with pompons, paint, glitter, etc. (Open card-Christmas in Poland) Print and laminate. Once you have visited the country, hang the card on a garland. Children can use the garland as a reminder of what they have seen throughout their trip. On Christmas Eve, children anxiously wait to see the first star in the sky since that is what determines the beginning of their Christmas celebration. When the Christmas table is prepared, straw is deposited under the tablecloth as a reminder that Jesus was born in a stable. The table is always set for one extra person in case a surprise guest arrives at the last minute. According to Polish tradition, the Christmas period begins on December 24th and ends on January 6th. On Christmas Eve, groups of children dressed up like the Three Wise Men, devils, angels, and shepherds go from door to door requesting coins and cakes. During Christmastime, people enjoy going for sleigh rides in the white countryside. Picnics are also organized. They light fires and roast sausages. For lunch, prepare an outdoor picnic. Cook different types of sausages and serve them with vegetables. 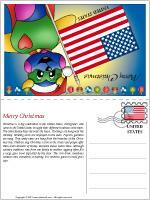 (Open card-Christmas in the United States) Print and laminate. Once you have visited the country, hang the card on a garland. Children can use the garland as a reminder of what they have seen throughout their trip. Christmas is a big celebration in the United States. Immigrants who came to the United States brought their different traditions with them. The entire family helps decorate the house. Stockings are hung near the chimney. Greeting cards are displayed on the walls. Popcorn garlands are hung. Tiny candy canes are hung from the branches of the Christmas tree. Children sing Christmas carols in the streets and people offer them small amounts of money. Everyone knows Santa Claus. Although culinary traditions vary from one family to another, eggnog often fills a large glass bowl deposited by the door. This rich drink sometimes contains rum, cinnamon, or nutmeg. It is served to guests in small glass cups. 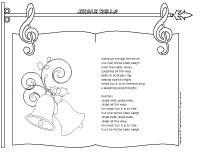 (Open songs & rhymes-Jingle Bells) Print. Practice singing this song with your group. They will be able to sing along whenever they hear it playing on the radio. In the United States, people make popcorn garlands. Print simple Christmas coloring pages or designs and have children fill the shapes with popcorn. Cut them out and assemble them to form a garland. Hang it from the ceiling. Variation: You can use flavoured popcorn (caramel, pink, cheese, etc.) to add color. If you prefer, color plain popcorn simply by placing popcorn in Ziploc bags along with food coloring. Shake to coat the popcorn pieces. Prepare eggnog with your group and serve it at snack time. Combine the milk and egg yolks. *It is recommended (but not essential) that you heat the egg-milk mixture to at least 71°C (160°F) and then refrigerate it in several small containers so it cools quickly to avoid the risk of salmonella. Add cinnamon, nutmeg, and vanilla essence. Mix. Refrigerate for 2-4 hours for best results. (Open card-Christmas in Greece) Print and laminate. Once you have visited the country, hang the card on a garland. Children can use the garland as a reminder of what they have seen throughout their trip. Santa Claus does not live in this sunny country, but Greek children know St. Basil who distributes gifts and candy to children who were nice throughout the year. There are no stockings hung by the chimney and there are no Christmas trees. For this reason, St. Basil simply leaves gifts near the fireplace or on the table. Traditional Christmas meals include feta cheese, dips, eggplant, etc. In Greece, the cook marks the bread she makes for Christmas by pressing her hand in the dough before baking it. In rural regions, the bread is shaped to look like an animal (cow, sheep, etc.) and one loaf of bread is broken up into pieces and given to the family's animals by the oldest daughter. Gifts are deposited on the table in Greece. Cover your table with a large piece of white paper (you may also use a solid plastic tablecloth). Invite children to decorate the perfect tablecloth. You may deposit special gifts on it once they are done. Prepare a Greek salad with your group. Cut a variety of vegetables (celery, onions, peppers, etc. ), feta cubes, black and green olives, etc. Mix everything together and enjoy! Prepare the following creative recipe with your group. Let children sculpt animal shapes just like Greek children would do with real bread dough. 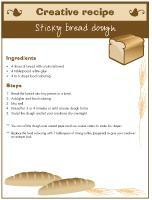 (Open creative recipe-Sticky bread dough) Print. Tear the bread into tiny pieces and deposit them in a bowl. Add white glue and food coloring. Knead the dough for 3-4 minutes or until dough is sticky. Sculpt shapes in the dough and let dry overnight. **You can roll the dough out on a piece of waxed paper and use cookie cutters to create fun shapes. **Instead of food coloring, you may use 1 tbsp of strong coffee (prepared) to give your dough an antique look.